Lubbers, K, de Vries, A.P, Huibers, T, & van der Vet, P. (2005). 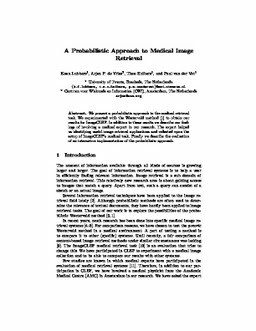 A probabilistic approach to the medical retrieval task. In Proceedings of Theseus/ImageCLEF workshop on visual information retrieval evaluation 2004 (pp. 761–772). Springer.